Progress in the field of security engineering requires constant learning in multiple disciplines . This learning is largely theoretical but to be fully effective need to be implemented. A security engineer should be able to put himself in an attacker boots and foresee with reasonable certainty what could be his next step . But this is difficult because an engineer can not go around attacking networks with the excuse that he is learning how bad guys work . Until recently, the only option available for students of security was to set up a laboratory at home collecting low-cost computers and network equipment . Unfortunately this was expensive , consuming an increasingly scarce space in modern homes and placed your partner / spouse / father / mother against you because they didn´t understand the utility of that. Fortunately , the era of virtualization came to the rescue so today is possible to assemble complex virtual laboratories within our computer. The easiest option are VMWare or VirtualBox, which are ideal for testing tools, rootkit, vulnerability, etc. on different operating systems without endangering our own computer. 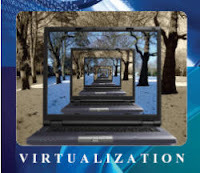 Starting several of these virtual machines can test simulating a LAN network. Even there are tutorials to simulate more complex topologies using VMWare. However, at that point carry such tools may require consume an amount of computer resources that may not count on. The other option is called Netkit , developed at the University of Rome. The focus is not so much the specific equipment emulation but complete networks . Netkit allows us to define a network topology and test with it. To do that we would begin a series of nodes that are only light Debian Linux virtual instances and we would configure them as the role they play within the network we want to simulate ( router , switch or end device ) . The kernel will use virtual machines . >  Checking path correctness... passed. >  Checking for availability of man pages... passed. >  Checking for proper directories in the PATH... passed. [ READY ] Congratulations! Your Netkit setup is now complete! At this point begins the really interesting. With the --eth0 parameter that interface is assigned to CD-A collision domain (we call them as we wish), and with the --M one we are gping to give 100 MB of RAM to the machine. You can see that Netkit creates a .disk file for each virtual machine created, that disk is where you keep your file system. Each file system uses default 1'1GB so you better make sure you have free disk space before starting an experiment with many machines. By doing vstart each xterm window appears with the virtual machine console that has been launched. If now we ping between the two machines you can see their reply . As you can see from the picture we gave time to PC-2 to send two ping PC-1 and this has answered correctly. And what PC-3 has seen?, answer is all: the arp of PC-2, the response of PC-1, the ICMP-request of PC-2 (round pings) and ICMP-reply of PC-1 (pings back). In fact PC-3 has heard the whole "conversation" between PC-2 and PC-1. 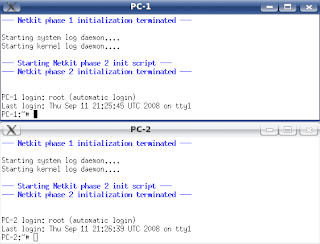 If this had not been a mere ping but a telnet session, PC-3 might have heard of the username and password of the person you passed from PC-2 to PC-1. Hence the importance of encrypting SSH terminal sessions. Well, not bad for a start, we have assembled an experiment with three PCs and a hub without having any of the four things ... Could not ask for more , does it? . In my next (or next ones ) article I'm going to delve into Netkit possibilities to develop more complex and interesting experiments . Update 2010-01-01 : In his new version, Netkit has changed the file system ( Debian image that is loaded with each of the virtual machines ) to a 10 GB filesystem. Fortunately , if we use partitions with serious filesystems ( ext , ReiserFS , XFS , JFS and NTFS ) not to worry because it will treated as a sparse file and will not take even a fraction of that size. The only thing you should do is extract all files downloaded from the web of Netkit in /user/share/netkit using the command: sudo tar - xjSf being the S precisely to treat stracted files as sparse ones. Thanx for the great post ! !